Mexican Border Period: May 9, 1916 through April 5, 1917, for veterans who served in Mexico, on its borders or in adjacent waters. World War I: April 6, 1917 through November 11, 1918; for veterans who served in Russia, April 6, 1917 through April 1, 1920; extended through July 1, 1921, for veterans who had at least one day of service between April 6, 1917 and November 11, 1918. Gulf War: August 2, 1990 through a date to be set by law or Presidential Proclamation. We assist veterans who are applying for disability compensation for service-connected injuries or illnesses. We can also help you reopen an existing claim when your injury or illness worsens. It should be noted: The payment of military retirement pay, disability severance pay and separation incentive payments known as SSB (Special Separation Benefits) and VSI (Voluntary Separation Incentives) AFFECTS the amount of VA compensation paid to disabled veterans. Veterans with low incomes who are permanently and totally disabled may be eligible for monetary support if they have 90 days or more of active duty military service. The discharge must be under conditions other than dishonorable. The permanent and total disability must be for reasons other than the veteran’s own willful misconduct. Payments are made to qualified veterans to bring their total income, including other retirement and Social Security income, to a level set by Congress. Unreimbursed medical expenses may reduce countable income. Veterans for a period of war who are aged 65 or older and meet service and income requirements are also eligible to receive a pension, regardless of current physical conditions. To receive health care, veterans must be enrolled with the VA. Enrollment may be accomplished by submitting a VA Form 10-10EZ along with a copy of your DD214 (Separation from Service) to the Eligibility Department of the VA Hospital in Martinsburg, WV. Healthcare through the VA Medical Center is limited to veterans – survivors and dependents are not eligible. Eligibility: Since January 2003, veterans who have service-connected disability rated at 0%, no service-connected disabilities, or a nonservice-connected disability are not eligible to enroll in the VA health care system unless they fall within a means test/net worth threshold. It is strongly suggested that veterans apply for enrollment and let the VA Health Care determine eligibility. Eligibility: VA educational benefits may be used while the service member is on active duty or after the service member’s separation from active duty with a fully honorable military discharge. Eligibility generally expires 10 years after the service member’s discharge. We assist veterans who are requesting replacement medals, service medical records, and/or military separation documents. NOTE for those requesting Replacement Medals: National Personnel Records Center has stated that the military has made a decision to limit the issuance of veterans’ medals that have been discharged for over 62 years. According to the National Personnel Records Center, this decision is based on the belief that, for over 62 years, the military has more than met is obligation to veterans and their descendents by issuing and reissuing medals and that the military cannot provide medals in perpetuity to all future descendents of military veterans. VA loan guaranties are made to service members, veterans, reservists, and unmarried surviving spouses for the purchase of homes, condominiums, and manufactured homes and for refinancing home loans. VA guarantees part of the total loan, permitting the purchaser to obtain a mortgage with a competitive interest rate, even without a down payment, if the lender agrees. The guaranty means the lender is protected against loss if you fail to repay the loan. Applicants must have a good credit rating, have sufficient income to support the mortgage payments and agree to live in the property as their primary residence. Veterans’ emergency assistance provides financial aid in an emergency on a temporary basis (not to exceed a three-month period) to veterans, their widows, infant children, or dependents who reside in Pennsylvania for the necessities of life (food, dairy, fuel, & clothing). An honorably discharged veteran must have served in the Armed Forces of the United States during established war service dates. Upon recent death of a veteran, their spouse or orphan children are eligible provided the veteran would have qualified prior to his/her death. Contact us for application and assistance. Any honorably discharged veteran who is a resident of the Commonwealth shall be exempt from the payment of all real estate taxes levied upon any building, including the land upon which is stands, occupied by the veteran as their primary residence, provided that as a result of wartime military service the veteran has a 100% service-connected disability rating by the U.S. Department of Veterans Affairs; that such dwelling is owned by the veteran solely or jointly with their spouse and the FINANCIAL NEED for exemption from payment of real estate taxes has been determined by the State Veterans Commission. Upon death of the qualified veteran, the exemption passes onto the unmarried surviving spouse, if the need can be shown. Contact us for the application and assistance. Franklin County pays burial benefits for war-time veterans and the widows at the time of death; and the installation of a standard government headstone or marker. The amount of the benefit is $100.00 towards the burial and $50.00 towards the installation of the headstone/marker. It is customary for the funeral homes, in Franklin County, to file for this benefit at the time of the veteran’s/widow’s death. Franklin County also supplies flag holders/flags for cemetery plots of deceased war-time veterans within the county. The flags holders are placed at the grave at the time of burial. Every year Franklin County purchases and distributes, through volunteer coordination, flags for honoring veterans for Memorial Day; however those flags are then taken off the graves the first business day after the July 4th holiday (at the discretion of the individual cemeteries). 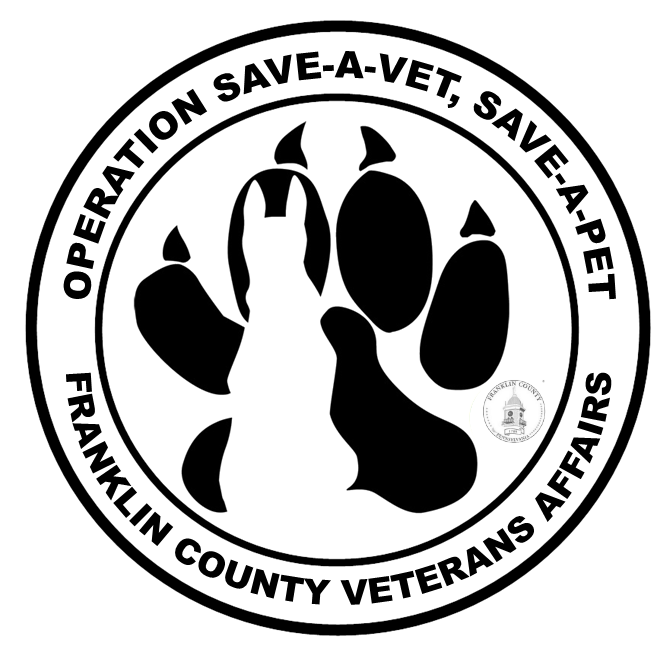 Helping Hands for Heroes is a partnership between Franklin County Adult Probation and the Franklin County Veterans Affairs Office. This program allows adult probation participants the opportunity to serve military members, veterans, and their families.